Several years ago the idea of a national youth sports, fitness and entertainment league solely for America's inner city was too difficult to imagine. 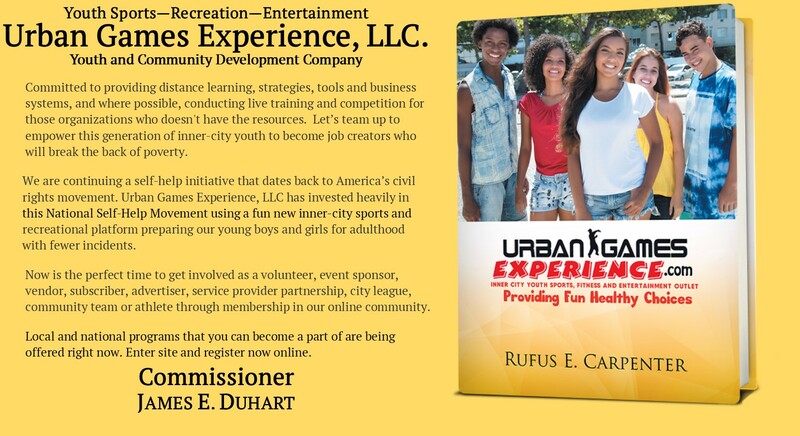 But today (August 2016), the Urban Games Experience, LLC will make it a reality. I see us becoming a great lifestyle brand that’s letting dance, music and culture tell great stories of young inner city boys and girls to our audience. Our organization is mostly made up of children from the inner city. A good deal of them does come from low income households. Our goal is to have them returning year after year. We saw a need for a program that spoke to the life of our inner city African – American children. This program was designed for children of color, African-Americans, Hispanics; where girls and boys could be themselves without all the violence and negative influences present. With your help we are creating a new venue offering live talent competition, music and entertainment outlets as a celebration of style, fashion, dance and culture. We’re celebrating the Black American spirit with music and rhythms that are rooted in African culture and traditions. Yes, a national self-help movement centered round the Black American Spirit, creating better opportunities for America's inner city youth. As we work to become a crucial entertainment outlet for Black American Culture. To re-imaging the African-American cultural, reach more minority audiences and incorporate an entertainment styles made up from sports, fitness and performing arts. Our goal and major emphasis is on growing the project to appeal to a diverse crowd. The synergy between the audience and the performers is unbelievable. The participant and specter each walk away feeling like they’ve undergone a real experience. Our products and services are based on 3 fundamentals: Training, Sports and Culture that has the ability to change lives forever. For the general public we provide inner- city youth sports, fitness and entertainment in a fun, music, dance and talent format. 3. Master making it, Matter - October 2016 to September 2017. Please, understand all this is being achieved by Ordinary People that God chose for this task. Working on the strategies that are practical, powerful and ready to implement creating a high-performing environment in which a little child will excel. Inner-city youth sports, fitness and entertainment offering that will keep our youth engaged, "The Urban Games" - a 73 activity system. 48 cultural and educational activities (12 National monthly themes, plus 36 local "Lesson -of- Week"). 25 sports activities schedule (8 National cultural celebrations, plus 17 Local weekly competition seasons, "Urban Games Society"). These 73 activities tied together correctly form the Urban Games System we are offering to make a difference in the lives of children. Right now we're still on schedule but have to get quite a bit done in the lives of the audience we serve. Let's talk through this; website and registration requirements, Lesson -of- Week, Social Media footprint (______@urbangamesexperience.com), source insurance requirements and setup Memarden. We have the use of this element worked out. I know that this is a lot, but we're well able as a team to go through this (See attached Urban Games Test Group.docx), I am available to discuss. Thanks hope to hear from you.